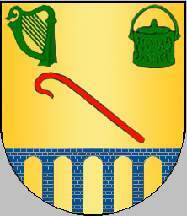 Shield Or, a bendy shepherd's staff Gules, in chief a harp at dexter and a milking pale at sinister, both Vert, in base a throughout aqueduct Azure masoned Argent. Mural crown Argent with three visible towers (village rank) and white scroll with inscription in black initials "ÉVORA-S. MAMEDE". São Mamede Commune was one of the pre-2013 communes of Évora Municipality (q.v. ); it had 1724 inhabitants in 2011 and covered 0.2 km². Shield Gules, e temple Argent, in base an open book Or, in chief two keys crossed per saltire, the bendy one Or and the sinister bendy one Argent, in centre superimposed by a heraldic rose Argent seeded Gules. Mural crown Argent with three visible towers (village rank) and white scroll with inscription in black initials "SÉ E SÃO PEDRO - ÉVORA"
The keys are representing St. Peter and the rose Our Lady of Mt. Carmel, both being name givers of the commune. The temple is representing the ruined temple of Diana, one of the monuments conservated best from the Roman period and made a national monument by decree from 10 January 2007. The book is representing the local University of the Holy Spirit (Universidade do Espírito Santo), located in the commune. Sé e São Pedro Commune was one of the pre-2013 communes of Évora Municipality (q.v. ); it had 1691 inhabitants in 2011 and covered 0.6 km². Shield Argent, a well Sable flanked in chief by a rounded cross patty Gules at dexter and a bell Gules at sinister. Mural crown Argent with three visible towers (village rank) and white scroll with inscription in black initials "ÉVORA - SANTO ANTÃO". The cross is alluding to the Order of the Templars. Santo Antão Commune was one of the pre-2013 communes of Évora Municipality (q.v. ); it had 1323 inhabitants in 2011 and covered 0.3 km².